Al Rose was born in 1942 in Kansas City, Missouri, and grew up in Fayetteville, Arkansas. He was commissioned a 2d Lt in the U.S. Air Force through the Air Force ROTC program at the University of Arkansas on May 30, 1964, and went on active duty beginning January 16, 1965. Lt Rose next completed Undergraduate Pilot Training and was awarded his pilot wings at Laredo AFB, Texas, in February 1966, followed by Pilot Systems Operator Training and F-4 Phantom II Combat Crew Training from February to September 1966. His first assignment was as an F-4 pilot with the 558th Tactical Fighter Squadron at Cam Ranh Bay AB, South Vietnam, from October 1966 to July 1967, followed by service as an F-4 pilot with the 9th Tactical Fighter Squadron at Spangdahlem AB, West Germany, from July 1967 to July 1968. Lt Rose next served as an F-4 pilot with the 10th Tactical Fighter Squadron at Hahn AB, West Germany, from August 1968 to February 1971, and then with the 334th Tactical Fighter Squadron at Seymour Johnson AFB, North Carolina, from March 1971 to April 1972. Capt Rose deployed to Southeast Asia with the 334th at Ubon Royal Thai AFB, Thailand, from April 1972 until he was forced to eject over North Vietnam and was taken as a Prisoner of War on June 21, 1972. After spending 281 days in captivity, he was released during Operation Homecoming on March 28, 1973. He was briefly hospitalized to recover from his injuries at Andrews AFB, Maryland, and then served as a test project officer with the Air Force Tactical Air Warfare Center at Eglin AFB, Florida, from January 1974 to September 1976. His next assignment was with the 602nd Air Support Operations Center at Moehringen AIN, West Germany, from September 1976 to September 1979, followed by service as an A-10 Thunderbolt II instructor pilot and Assistant Operations Officer with the 358th Tactical Fighter Training Squadron at Davis-Monthan AFB, Arizona, from October 1979 to May 1982. 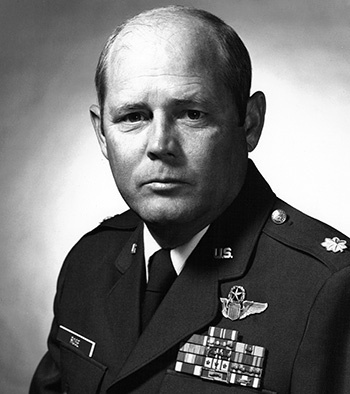 Col Rose served as Commander of the 355th Tactical Training Squadron at Davis-Monthan from May 1982 to November 1984. His next assignment was as Chief of Wing Weapons and Tactics for the 355th Tactical Training Wing at Davis-Monthan AFB from November 1984 to January 1985, followed by service as the Assistant Director of Operations for Air of the 602nd Tactical Air Control Wing at Davis-Monthan from January 1985 until his retirement from the Air Force on February 1, 1986. First Lieutenant George A. Rose distinguished himself by extraordinary achievement while participating in aerial flight as an F-4C Pilot in Southeast Asia on 11 November 1966. On that date, Lieutenant Rose was scrambled on two occasions from the F-4C alert area in response to friendly forces in heavy contact with determined hostile forces. Each scramble required Lieutenant Rose to expend his ordnance within fifty meters of friendly positions. Displaying exceptional pilot skill and disregarding personal safety, Lieutenant Rose struck time after time with pin-point accuracy to relieve the beleaguered friendly forces. The professional competence, aerial skill, and devotion to duty displayed by Lieutenant Rose reflect great credit upon himself and the United States Air Force.